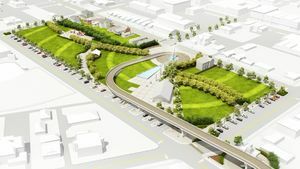 On Saturday morning, Jeffersonville residents gathered to view the revised plans for Big Four Station, the new park situated at the foot of the Big Four pedestrian and bicycle bridge. Revisions to the original design were made based upon a public hearing earlier this year, and from additional input Jefferson Mayor Mike Moore received during several of the evening neighborhood meetings he hosted. Some of the design changes include a new location for the restrooms, LED lighting being placed on the railings rather than on the bridge ramp, a different route for the running path, and some changes in the design of the park’s light fixtures and signage to blend in better with the historic Rose Hill neighborhood nearby. 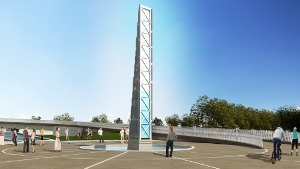 There have also been changes made to the design of the obelisk, which will be at the center of the landing. The design will relate to the former railroad crossing at the site and there will be a marker on the obelisk indicating the height of the river during the 1937 flood. Also, the water feature which will surrounded the obelisk was reduced in size. Perhaps the most notable change from the original design is the vast amount of greenspace, roughly 80 percent, included in the park. Louisville’s Great Lawn in Waterfront Park has become an award winning and popular gathering place for the community, and the goal is for Big Four Station park to become Jeffersonville’s gathering place for all residents. But unlike the Great Lawn, Big Four Station is connected to the downtown central business district, likely bringing more people into the shops and restaurants in Downtown Jeffersonville. The ramp is expected to be completed in April and Big Four Station Park is estimated to take an additional 14 months to complete. Click Here to view the video.